Saltwater chlorine generators have become the product of choice for swimming pool sanitation over conventional liquid or chlorine tablets. 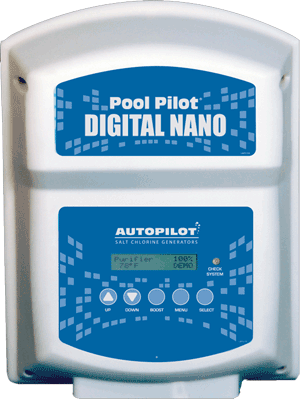 AutoPilot Sanitizing Systems Offers all the Advantages of Salt. More compatible with eyes, NO MORE RED EYES! Are You Wondering About Putting Salt in Your Pool? Four parts per million of chlorine is ten times as corrosive on stainless steel than 4000 parts per million of salt. AutoPilot Sanitizing Systems operates at only 2500-3000 parts per million (ppm). Your taste level for salt is approximately 3500 parts per million. That is 20% higher than the normal AutoPilot operating range! 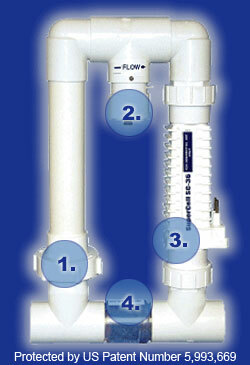 AutoPilot’s patented bypass manifold is a pre-assembled unit designed to control the flow rate delivered to our cell. The spring check valve in the manifold allows excess flow, over 20 gpm, to by-pass the cell. The water in turn flows at a controlled rate through the cell where it is super chlorinated. The in-line strainer on the inlet side of the manifold protects the tri-sensor and production cell from debris that might bypass the filter. The location of the strainer next to a connection union makes periodic cleaning easy. The design of our patented bypass manifold guarantees optimum chlorine production and simplifies the installation process of the AutoPilot Purifing System. In-line Strainer – The in-line strainer protects the Tri-Sensor and the Cell from debris that may by-pass the filter and obstruct either component. The location of the strainer in the connecting union makes it easy to remove for periodic cleaning. Tri-Sensor – The Tri-Sensor is a three way sensing device which measures flow, salt level, and water temperature. Chlorine Production Cell – The cell produces 100% pure Sodium Hypochlorite in your pool plumbing returning it to your pool. Check Valve – The check valve in the Manifold allows all water flowing through the plumbing at a rate greater than 20 gallons per minute to by-pass the production cell to maximize the production of chlorine. Call 239.432.1500 today to get a saltwater chlorine generator for your pool.